WHAT TO DO WITH MY STUFF? Aside from blogging here and being an astrologer, I also am what has been called an archivist of popular culture, meaning I have aggregated lots of stuff. For example, I am the curator of the Heart Center Astrological Library, one of the largest astrological libraries in the world, if not the largest. Now that I continue to get older (which so far has been a good thing), what to do with this collection when I no longer can care for it is an unavoidable task that I face. It would be sad to have the collection just broken up and sold off on Ebay or something like that. The major astrological associations apparently have no space or funds to house it, so that leaves me to figure out a solution. I have written to all the colleges and universities in the U.S. to see who is interested, and many are, but few have space. Libraries, as some of you may know, are changing. They too have little funds and even less space to house books these days. And magazines are even harder to collect. I am certain that my collection of periodicals is quite complete. Magazines and journals are most perishable and hard to find and maintain compared to books. So I am doing two things. Yesterday I had a visit from the University of Illinois, the third largest library in the world. They came to see the library and, of course, they loved what they saw. I have decided to place the collection in their hands. This will probably take place later this year. They will send a moving company and the collection will have a permanent home where scholasr and just plain folk can access it. This is the best solution. The second thing I will do is to remove the duplicates from the collection and donate "seed" collection to worthy groups or organizations. I will start to do that right away. So there you have it. That's my plan. Will I miss the books? Not really. It is more important that they have a good home than that they comfort me by their being around. Some years ago I donated my extensive collection of data, images, notes, and interviews of rock-concert posters to the Bentley Historical Library at the University of Michigan, including 30,000+ images of the most important posters from the 1960s through the 1990s. My poster site ClassicPosters.com is still around on the web. And there are other of my collections that I no longer have. My large library of music and film books became part of AMG (All-Media Guide) when I sold that company some years ago. And in a warehouse in Ann Arbor sits my collection of music CDs, over 600,000 of them, I have to admit I have been an aggregator of "things" my friends. And not just things. Even more extensive are my collections of virtual objects, like data. I founded the All-Music Guide (allmusic.com) around 1990, and today it is the largest music database of reviews, music samples, biographies, discographies, and albums on the planet. It has no competitors and probably millions of data fields. I also founded the All-Movie Guide (allmovie.com), which is one of the two largest collections of films and movies, including complete casts and characters. The other large movie database is IMDB, owned by Amazon.com. I also founded the All-Game Guide (allgame.com), and so on. When I left AMG, I had 150 full-time employees and over 500 freelance music writers. For me, that is a lot of employees. Glad I am not doing that anymore. So, I am indeed an archivist of popular culture. I have even won a lot of awards, etc., including one from Yahoo Life years ago, where I had to fly to New York to receive it, be on TV and so on. So placing the Heart Center Astrological Library in a good home is pretty much the last large collection I have. 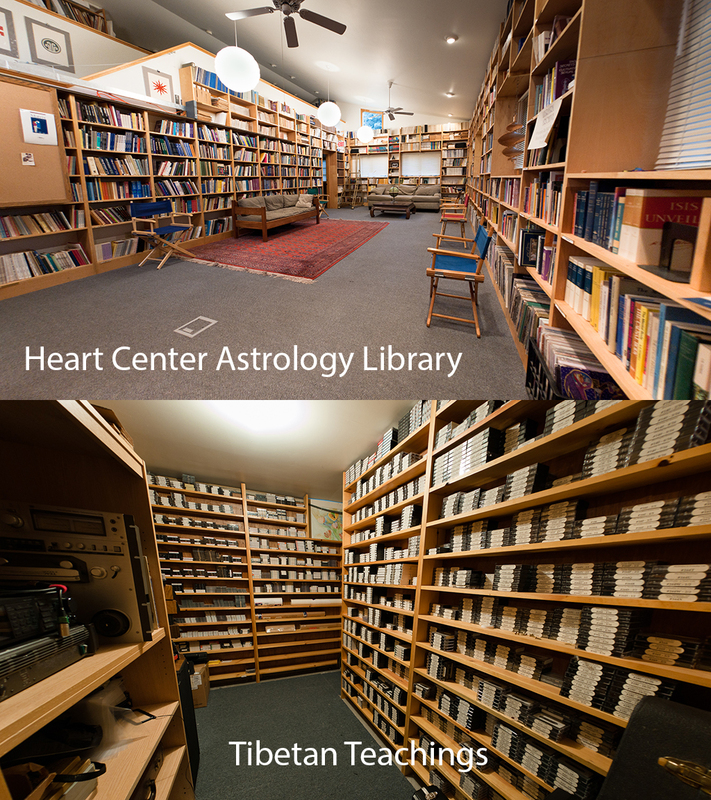 I do have a whole room of thousands of tapes recordings of Tibetan Buddhist teachings, and a library of Buddhist books, but most of those teachings have been digitally mastered at this point. Not sure what to do with the tapes themselves. The Buddhist books I am still very much using. I am like one of those pictures of a toddler walking away, who leaves things in his wake behind him as he goes. Gradually I am divesting myself of all these things. So there you have a brief history of some of my "things."